The second quarter brought good news again for the US's four major public rail carriers, while Old Dominion again flew high among less-than-truckload carriers in a quarter that all improved their results if not exactly deliver outstanding results in some cases. It was clear pricing was on the mind of the LTL carriers' CEOs, with several mentioning success in the pricing arena in Q2 and pledging more increases in coming quarters. Last week, we reviewed Q2 results for the truckload carriers, an article you will find here: US Truckload Carriers Enjoy Mostly Strong Second Quarter, but as Usual Recently, Logistics and Intermodal Lead the Way. As shown in the chart below, all four public rail carriers (Burlington Northern was acquired by Warren Buffet's Berkshire Hathaway in 2009) enjoyed strong results, and continued to enjoy relatively strong pricing power. Despite car load growth of just about 3% for three of the four (the smallest of the four, Kansas City Southern, saw volume growth of 7%), revenues were up 13.3-17.9% for all four of them. While some of that revenue growth came from fuel surcharges, pricing also played a strong role. All four carriers saw double digit profit gains, with Kansas City Southern roaring back after a tough 2010 in terms of net income. 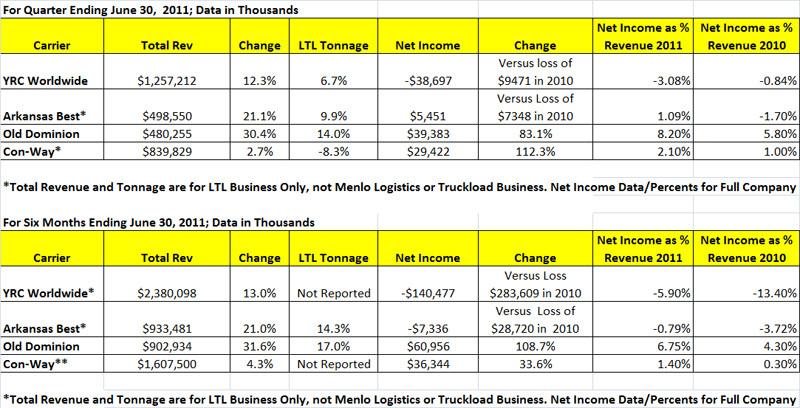 The rail carriers are very profitable versus either truckload or LTL carriers, with profit as a percent of operating income in the mid or high teen percent range in rail, versus the mid to low single digits for truckload carriers and a barely profitable LTL sector (Old Dominion is the exception). Growth in intermodal volumes played a key role for all but Union Pacific, with volume increases ranging from 8-13% being seen for the other three rail carriers. Norfolk Southern was alone in seeing a big upsurge in coal car volumes, rising some 20% year-over-year in the quarter. We're not sure the US needed that much more coal in Q2 than the previous year, so that is a bit of a mystery, though coal exports are likely the driver of that gain (which we see now are likely to reach a 19-year high in 2011). Norfolk Southern noted its pricing power in the quarter in a backhanded way, saying it saw "a 14% increase in revenue per unit." While some of that likely came from better asset utilization and mix, we believe price played also played an important role. Similarly, CSX said that "Overall revenues were driven by volume growth, pricing that reflects the value of freight rail transportation, and recoveries that offset higher fuel prices." In case you missed it, the "pricing that reflects the value of freight transportation" is a euphemism for rate increases. CSX, however, also noted it is committed to plowing back a significant portion of that revenue into its network, saying it "expects to make 2011 capital investments of $2.2 billion. That is consistent with its intentions to reinvest an average of 18% of its revenues into its business through 2015 to further enhance the capacity, quality and flexibility of its rail network." Union Pacific says its own investments are paying off in terms of customer satisfaction, noting that its "Customer Satisfaction Index of 92 set a new all-time quarterly best record, three points better than the second quarter 2010." It is worth noting, however, that rail volume growth clearly stalled in Q2 versus Q1 (compare the full six month growth versus the last quarter), likely an indicator of the slowing economy most other metrics are also showing. The generally beleaguered LTL sector saw mostly good news in Q2, and even especially challenged YRC Worldwide saw bits of good news as it tries to crawl its way out of the financial hole it built from a series of major acquisitions over the past decade and related "execution" problems. Operating revenues were up pretty big at three of the four carriers, as was total tonnage. Revenues were barely up for Con-Way and its tonnage down, but its CEO said that was the result of strategic decisions to be more selective in what freight it carries and reducing its network to remove unprofitable areas. Old Dominion really blew away the field, with revenues up more than 30% and tonnage rising by 14% in the quarter. Not surprisingly, that led to a large gain in profits (83%), with Old Dominion being the only one of the four carriers to product a reasonable profit versus operating revenue of 8.2%. YRC did manage to significantly reduce its operating loss in the quarter, dropping that to just $2 million (much below its usual losses in recent years), and that included $17 million professional fees for its on-going financial restructuring program. Just after its Q2 earnings release, YRC announced that former Yellow Freight executive James L. Welch was coming back to lead the company as CEO, replacing an interim executive put in place after Bill Zollars, architect of the acquisition strategy and financial turmoil, was asked to leave in September, 2010. Arkansas Best (ABF) CEO Judy McReynolds noted that while "healthy tonnage levels plus increased account pricing" were key to its improved Q2 results, recent pricing improvements still "not enough to produce sufficient returns to shareholders or recapitalize our business." Similarly, Con-Way noted that "“Margin expansion continued, driven primarily by pricing improvements and ongoing operating efficiencies," saying it "will maintain our focus on pricing discipline and initiatives to improve margins" in coming quarters. Just to note the differences in the current state of affairs right now between Old Dominion and YRC, the latter's operating ratio, or operating costs as a percent of revenue, was down to just just 86.5 in Q2, fueling its high level of profitability. Conversely, YRC improved its operating ratio to 99.2% in its national LTL operations, meaning it basically breaks even before other costs are factored in. Arkansas Best didn't do much better, with an operating ratio of 98.2 in Q2 compared to a terrible 103.3 in the previous-year period. Any reaction to our Q2 rail and LTL carrier results and commentary? Is this sort of information useful to you? (We would really like to know). Let us know your thoughts at the Feedback button below.